Who says that tattoos can only be done on skin? Certainly not Steed Taylor. The New York based artist holds a firm belief in the ability to alter the definition of what exactly “skin” is. Steed sees roads as the skin of the cities in which we inhabit. That’s right, roads – as in the ones you travel down every day. How does one go about tattooing a road? Well, with paint of course. In fact the entire procedure borrows much from the idea of graffiti, which is fitting as many tattoo artists were once graffiti artists or continue to paint graffiti in addition to their tattoo work. Taylor has tattooed roads in New York City, North Carolina, Arizona and Beijing, China. His most recent work will take place this weekend, July 24th-25 on the 800 block of Vermont Avenue N.W. (between H and I streets) bordering Lafayette Park and McPherson Square in Washington, D.C. 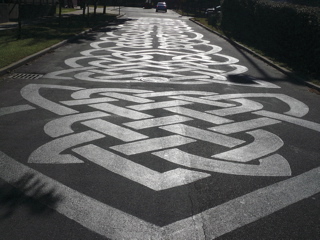 The design, a 60-foot-wide, 300-foot-long Celtic knot, will represent community interdependence. I myself really didn’t think that tattooing could go in any other direction than being what it currently is: a method by which to permanently etch art on to flesh. I guess I was wrong though, because Taylor’s concept for tattooing roads really appeals to me. Imagine a city where the roads were as covered with art as are the tattoo sleeves seen on people. What a very cool look that would be for any city. If you live in the D.C. area and you’re interested in helping out this weekend with Taylor’s street tattoo, you can get more information on the entire thing by emailing info@galleryplanb.com or steed@steedtaylor.com.